The race that stops the nation, Melbourne Cup, is fast approaching! 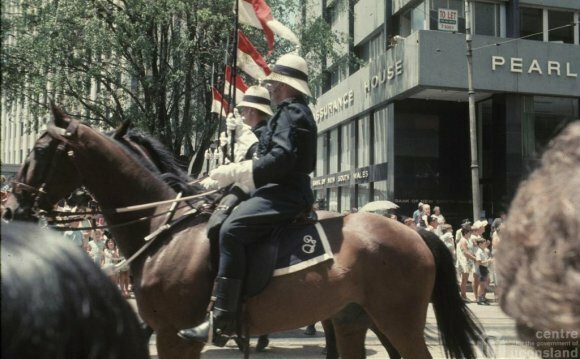 As the horse racing industry saddles up for the biggest race meet of the year the Queensland Mounted Police Unit focuses on the care and retraining of a handful of thoroughbreds whose race careers didn’t make it as far as the Melbourne Cup. For years the Mounted Police Unit have relied on the donation of retired racehorses and have used a variety of retired racehorses including Chief De Beers, Private Label and Dance Hero. Their owners donated the horses to the Mounted Police Unit in order for them to have a good home and purpose following their careers. Retraining thoroughbreds who have been bred to race can be a long and involved process. In recent years the Mounted Police Unit have commenced a trial of purchasing horses which is proving to be very successful. In 2014 retired race horse ‘Bloody Quick’ made his debut with the Mounted Police Unit. Known to us now as ‘Jackpot’, he was purchased in June after he successfully completed the pre-purchase trial period. Jackpot is a 12-year-old 16hh chestnut thoroughbred gelding. Following a mediocre racing career, Jackpot was retired in 2009 most likely due to his age. Jackpot has made the grade as a Queensland Mounted Police troop horse due to his temperament and re-trainability. After a short introductory training program he has been used in a variety of deployments including patrolling Brisbane City, Fortitude Valley, Gold Coast and Ipswich. He has travelled to Townsville, Gayndah and Warwick to assist local police patrol events such as Gayndah’s Orange Festival and Woodford Folk Festival. To hear more about the Queensland Mounted Police Unit and Troop Horse Jackpot’s life after racing tune into radio station 612 ABC on Tuesday November 3 at 10:00am. A field reporter will be talking live with Acting Sergeant Simon Shilton on site at the Mounted Police Unit. Gregory Downs is a small town located near the Gregory River in the Shire of Burke, Queensland, Australia. The town had a population of 40 people in 2008. and is situated on the banks of the perennial Gregory River.